Toc, toc! Qui est là? A little girl is sat in bed when there's a knock at the door. It's a great big gorilla with fat furry arms and white teeth. Next time there's a wicked old witch at the door, then a creepy ghost, then a fierce dragon. Each time there's a knock at the door, there's a different monster, but each time they're wearing the same tartan slippers. Is it Dad in disguise? Toc, toc! Qui est là? 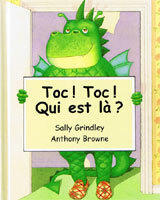 is written entirely in French with no English translation or pronunciation guide as it is intended for native users. Each page features just a few sentences of fairly simple language making this an ideal book to use with young children or beginners to the French language. This was thoroughly enjoyed in class.Quirky illustrations .The vocabulary was a little challenging for younger children but it can easily be "edited"as one reads.